Changing up the dining table is one of my favorite places to play. I usually tend to think every table has to have candlestick and then when I see all the beautiful tables that everyone else does, very few have candlesticks. They use all kinds of objects as part of their centerpiece. That got me to looking through my stash to see what I had. I was using white goblets and my flowers were all white, so I dug out a few white accessories that I had. I really liked how the crackle texture on the finials looked next to the iridescent stripes on the vase. Hunt for vases with different textures or shapes to give your vignettes more interest. This was fun for a change, now I need to see what else I can create down the road. Beautiful table! When I saw the title of the post, I thought of years ago after Memorial Day, we would all get out our white shoes and white handbags. Very pretty Marty. I love your white goblets. And, I love that you dining area is in that little niche near the stairs. So warm and inviting. I like it, Narty. I also like candlesticks and you have always done beautiful tablescapes with or now,without, candles. I love it! I agree white does have a cooling affect! Great mix of elements. So glad to know you are doing well after your back surgery and are able to start physical therapy. 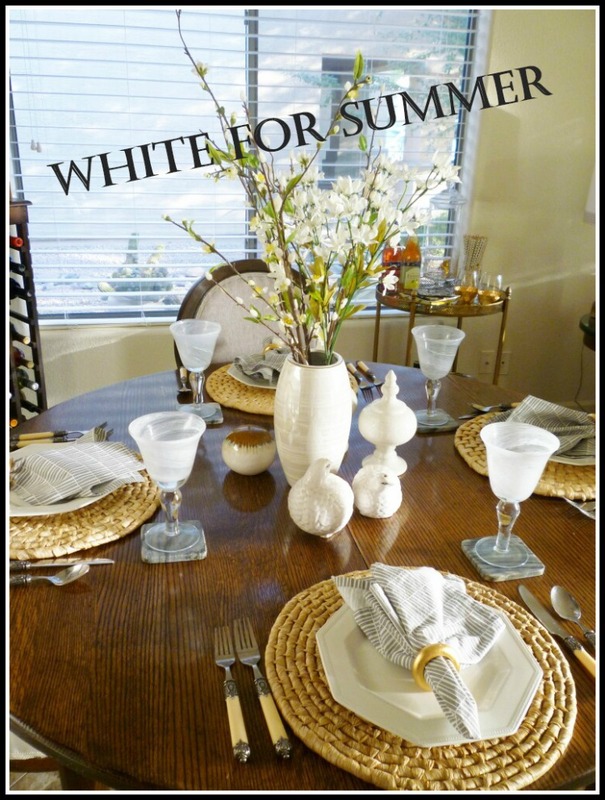 Your white table is really inviting. I just can't get enough white these days. Love the way the shadows are casting across the table. Beautiful Marty and you know me I love the whites. Very pretty. Happy New Week. Glad to hear you are starting your PT. Love your tablescape - and the wood of your table is stunning. Hugs. Get well soon.